Bed extensions as well as other axis extensions are becoming more and more popular as owners try to squeeze out every possible mm of usable print space. 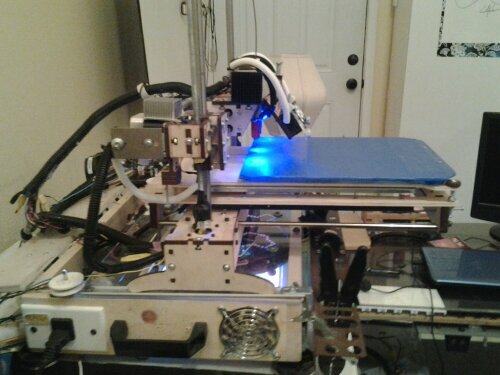 I’ve decided to give it a whirl on my already large Printrbot Plus. 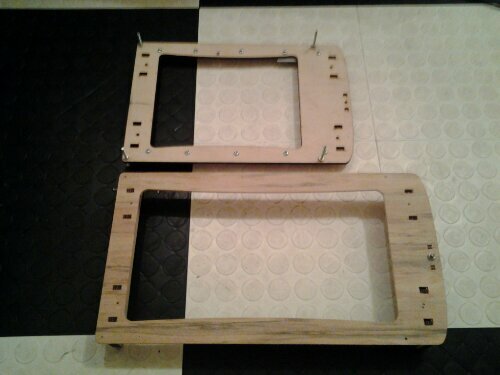 A friend of mine has a CNC and offered to cut the bed and sub-mount to my new specs. 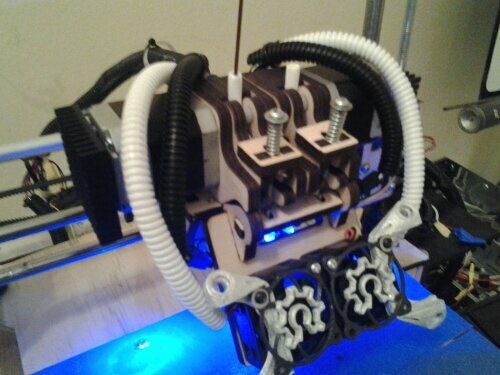 I wanted to be able to match it up to the Printrbot parts as well as styling. I took the opportunity to upgrade my rods and bearings as well. I purchased a set of 18″ hardened chromed rods that are specifically designed for 3D printers and other linear motion applications. The new bed and sub-mount were designed with two 8×8 heated beds in mind. 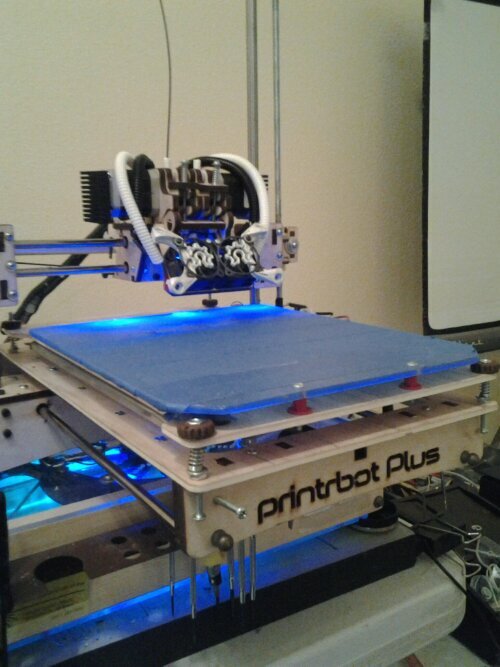 I wanted to be able to print ABS as well other filaments using the entire print bed. The plan is to have an aluminum plate milled with pockets to fit the 2 – 8×8 beds into which will help to keep heating times low. It will also help to heat quicker using two beds wired through individual SSR’s. The thermistors are also planned as a duplicate. A friend of mine as well as a few others have already done this, so with a little bit of help I too shall run two beds. I will control the setup with a fotek SSR or solid state relay. I just talked to my buddy and he said that it does require a little more work than I originally was told but, it’s not rocket science. I will put up detailed information once I get to that point. Update: I have got some updated information on how two heated beds on one platform will work. There are several different ways you can go about doing this, one way is to build a board that uses SSR to control both beds. The other is to use two pid controllers that run independently of the main controller. The easiest method to implement would be to buy two pid controllers that use k type temp sensors. They typically come with a readout display and you need to make sure they operate in a range up to 150. I’ve seen them for about $20 if you shop around. Amazon.com is supposed to carry them. I will also be using a basic temp sensor setup to monitor the surface temps in 2 places so I can help tune in the pid settings. For now my plan is to use a custom milled aluminum plate that is slightly oversized and swap out a full sized Lexan plate for printing PLA. I primarily print PLA so having a little bit smaller plate for ABS isn’t an issue right now. The overall length of the y axis is about 17.5 inches and I already extended the z axis to 16.5 inches. My only limit is the x axis which I plan on eventually making wider by a few inches. I have quite a few projects in the works and one of them is a modified printrbot plus that will primarily consist of aluminum parts. The x bridge and carriage have already been finished with a height of about 20 inches and an huge x axis at 16 inches. More than likely it will have a 16-17+ y axis. This is about as large as I have been able to reliable extend the plus’s platform. 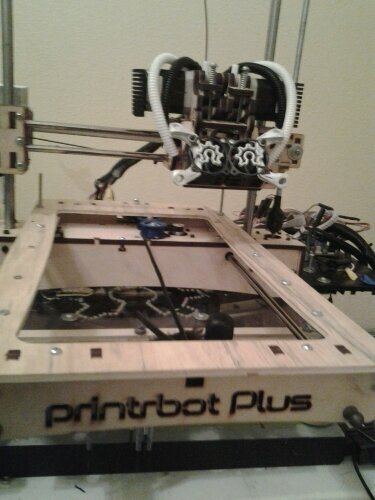 We have done an entire post on Printrbot’s dual extruder beta and now we have received the production version that you can buy on Printrbot.com We will be detailing information on the production version as we get it installed within the next week or so. 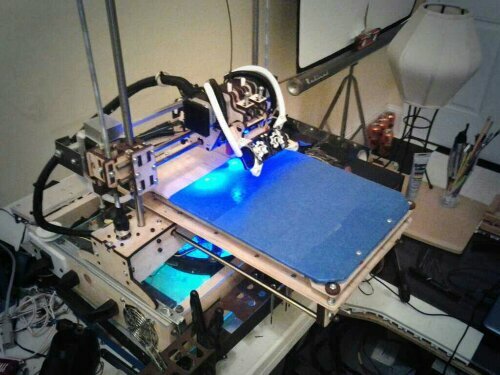 We took a look at the kit briefly before heading out of town to work on some of RepRap Squads other projects. The new dual extruder kit has an all aluminum extruder mount with easy access to the adjustment screws. This is very important when operating and dual extruder setup. I’ve found that there are times when you want a small offset between the extruder height but, for the majority of printing you will want them to be exact. This is what printrbot did well. The aluminum extruder mount holds the extruders firmly and I’m not sure what kind of thermal effects the aluminum will have but, I’m sure it’s something that printrbot did intentionally. They also give you all the pieces required to update your v2 carriage to the new styling of the v2.1 – which we really like as it is a lot better design. Today I plan on digging as deep as I can into the dual extruder production version. 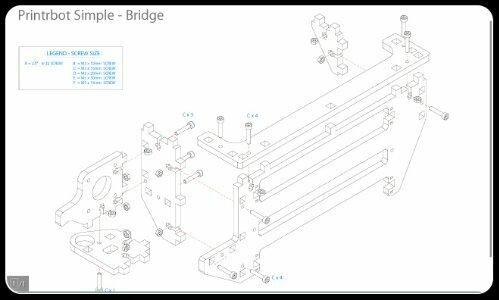 One thing I had noticed by looking at the parts is that the x bridge rod spacing will be changed for those of you that have a plus or LC V2. The rods will be moved closer together to match the rod spacing of the V2.1. 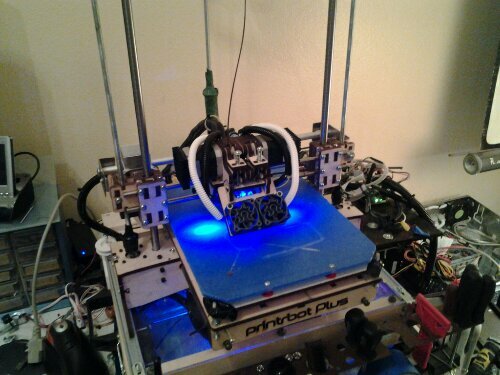 This is actually a verge simple conversion as Printrbot included the new x rod mounts. 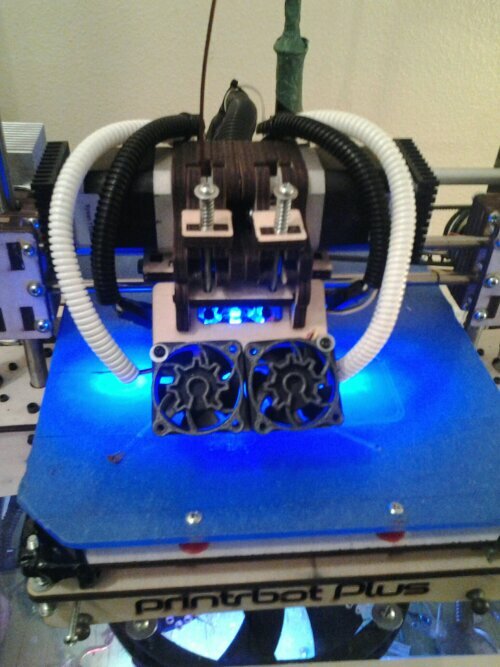 The only downside is that any parts or mods you had to fit the x axis on your V2 will now not fit. 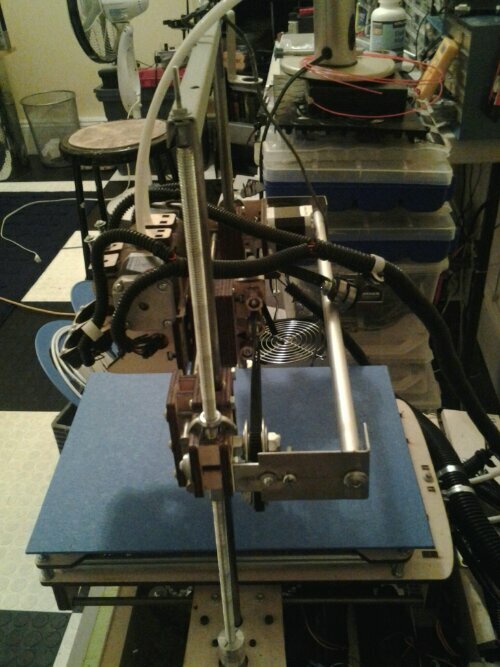 Essentially I now have a Printrbot Plus V2.2 without the fully widened x axis because the V2.1’s x axis was extended to accompany the extra space needed for the dual extruders. I guess that means we have some sort of hybrid between the Plus V2 and the V2.2. 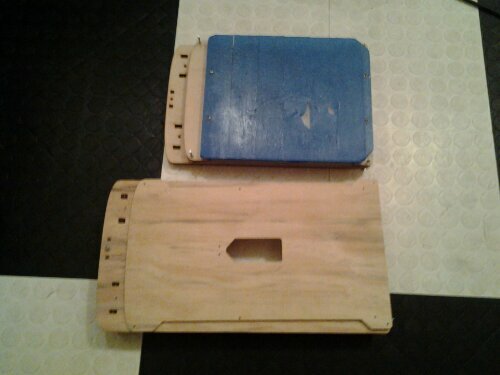 I had some parts made specifically for the V2 that will now have to be remade. I will update as I go today. I am most of the way through assembly with a little wiring left to go. I still need to flash my replacement board and install it as well. I added quick disconnect locking connections to the led task lights as well as the fans so that if they ever need to be replaced I can just unlock them and click on the new ones. I bought a pack of 40 on eBay for about $2, which was a really good price. Those connectors are very similar to the ones pb uses. 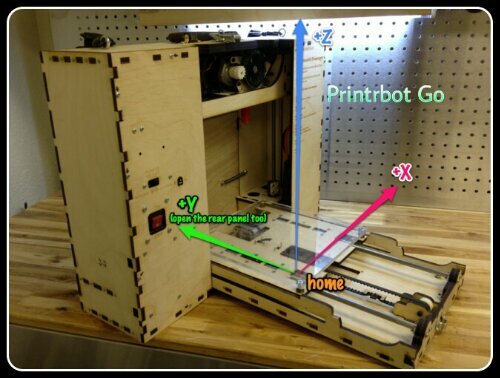 Printrbot did a great job of putting together this add-on kit. It probably took about 2 hours to assemble the new kit and disassemble the old one. Remember I had the dual extruder beta kit and then transformed into the production and the production version which is way better. You can really tell that Brook took into account all the issues us beta testers had with the beta version. Not only that but, they took it to next level. 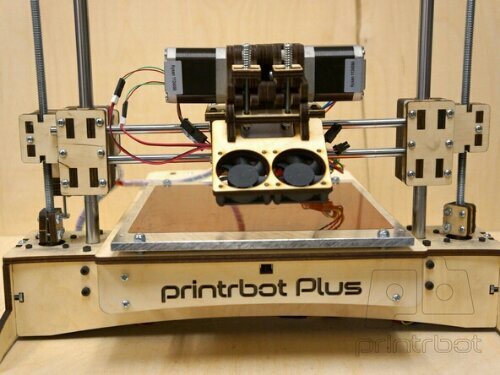 If you have a printrbot plus v2 and you buy this kit then you get a lot more than just dual extruders. This kit changes the rod spacing to make it match the v2.1 as well as aluminum bearing blocks for the x axis. It also changes the whole carriage to the new v2.2. So it blends a little of the old with the new. The new rod spacing is about 10-12mm or so closer together than the stock v2. I still need to organize wiring as well as rebuild my cable carrier that runs on a rail system that uses two abec5 608 bearings it also doubles as a stabilizer for the x axis. I used aluminum tubing and steel L shaped brackets to build the x stabilizer. If you haven’t noticed by now, the majority of my mods serve more than one use. 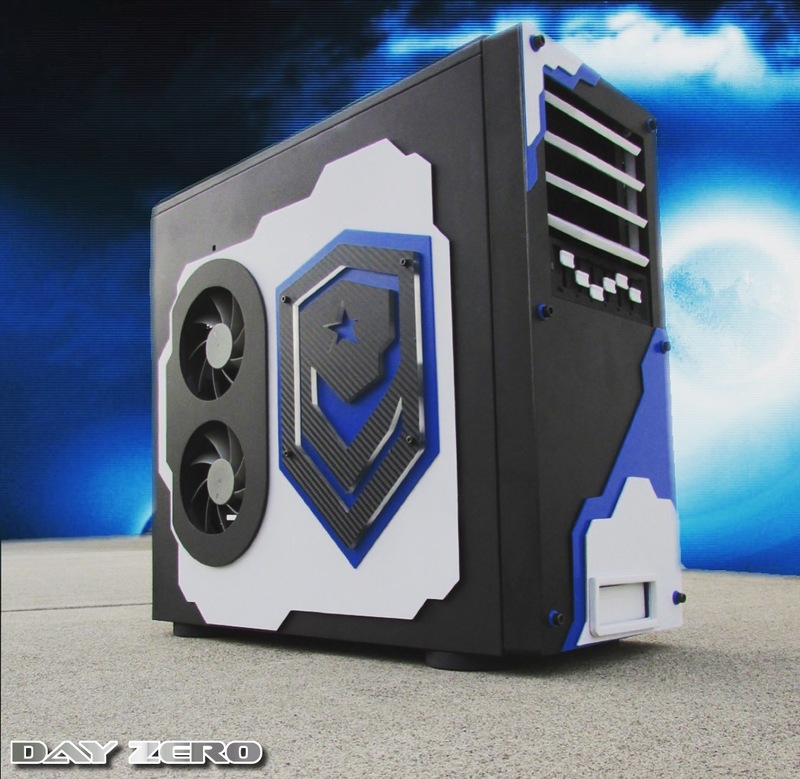 One thing that I did change due to the depth of my fans, was to move them on top of the fan plate instead of the stock location which would be under it. This allows for better clearances that would be an issue if mounted in the normal location. Printrbot did a great job of opening up the view of the extruders, the beta version had them enclosed which made it hard to see the prints during operation. 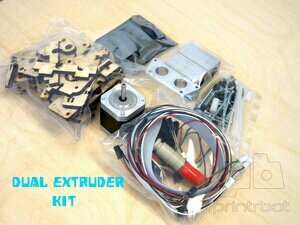 Here's the almost together dual extruder kit.. Still needs lots of wiring done to make it just right. Today I finished up wiring the fans as well as the Printrboard controller. I also flashed the unified v2 firmware which is different from the firmware we used while beta testing. 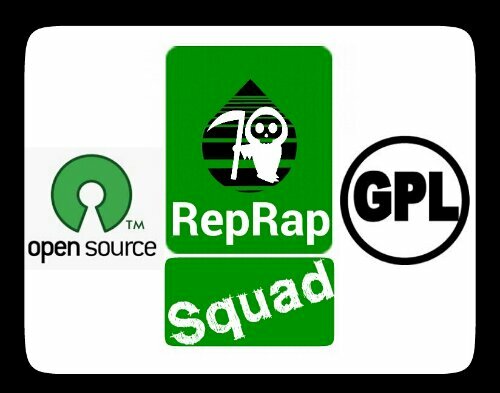 I took the opportunity to upgrade Repetier to the newest version as well as slic3r. I started having issues when I connected my printer to Repetier for the first time. After doing an M119 gcode command to check the status of the endstops or homing switches, I realized that it thought that they were triggered when they were not. After doing some troubleshooting I found that the old firmware required the endstops to be wired opposite of the new unified firmware. 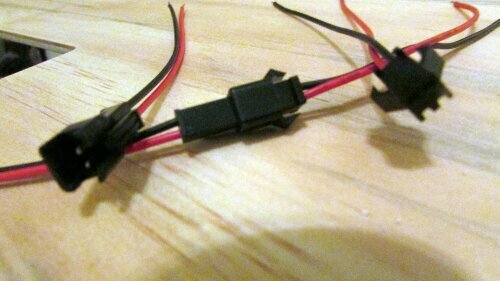 So I ended up pulling off all the endstops to rewire them to correct the issue. Tomorrow I plan on re-calibrating the entire bot to make sure everything is running how it should. I fired up the plus today to make sure my endstop or homing switch rewire fixed the issues and it did. Everything moved correctly and I thought I may be ready to start with a few prints. Loading the filament for the first time was a learning experience. I’ve done it plenty of times but, the newly designed extruder leaves less room where the filament feeds in. The reason printrbot did this was to get rid of an old topper that helped with feeding but, didn’t always work correctly and came off rather often. The dual extruders face each other so there is no side access like you might find on the single extruder models. Looking for a way to find access to the hobbed gear I found that if you lift up both fans you get great access to the gears and insides of the extruders. Everything looked to be functioning correctly so I thought I might throw a couple prints through it. After finally getting the filament fed into the extruder and priming it, I hit run the job. 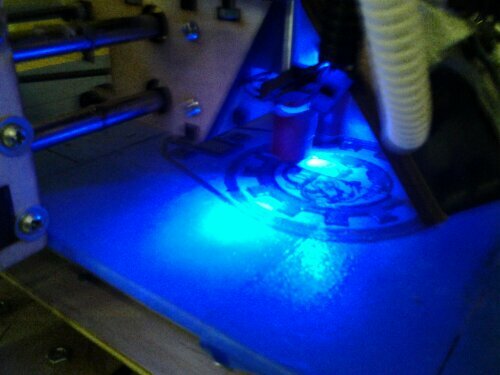 Everything looked to be functioning correctly but, I wasn’t getting any filament coming through the hotend. After a little trial and error I realized that I forgot to rotate the extruder motor plug on the Printrboard. The reason mine was running backwards was due to the beta firmware having backwards motor setup that had to be fixed by flipping the plug. 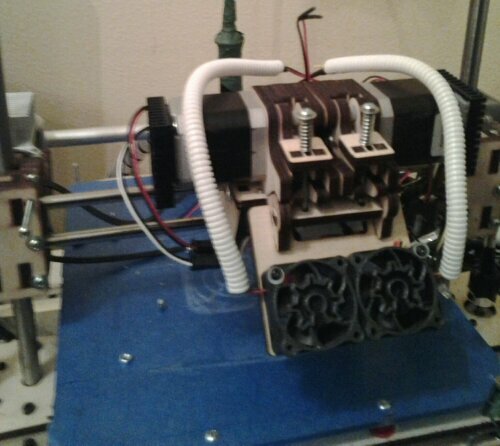 So I flipped the extruder motor plug back to its stock orientation as required by the unified v2 firmware. Tomorrow I will start calibration as well as setup the correct extruder height. My first few prints started out good but, later failed due to the filament slipping off of the hobbed gear. Printrbot recently changed the wood DDE designs which got rid of the top support that keeps the filament in line with the hobbed gear. They made an attempt to close up more of the top of the extruder but, it wasn’t enough to keep the filament where it should be. I’ve found a couple printable options, the first place one on thingiverse requires a longer print as well as drilling into the top of your extruders. This is an issue especially if you can’t get your extruder to work very long. The 2nd option is a short print and it is held in by pushing it into the top gap. I will be experimenting with non printable options due to the lack of function I currently have on my extruders. After spending part of the day attempting to fix the guide issue, I was finally able to find some 4mm ID tubing that I was able to wedge into the top of the extruder. So far it has held in place and is working great. I started printing out a slew of back logged items that needed to be finished. I’ve ran the machine about 3 hours total with each print about an hour each. I will probably run it for another hour or two before I call it a night. Hopefully I can pick right where I left off to make a dent in the back log. I’ve had no issues for the last week or two of almost non stop printing. 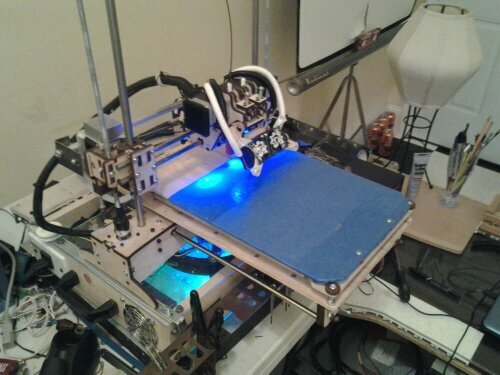 Since the installation of the new dual extruder I have also installed an extended y axis. The new extended bed is very stable and thanks to the new upgraded 17.5″ chromed rods it has also proven to be more accurate. I am very impressed with the quality and repeatable great prints. A few more upgrades are planned and will be reported here.